The manner in which your tax case is presented to the IRS is crucial in reaching a successful tax resolution. A New Jersey tax attorney like Todd Unger are trained negotiators who can present your case to the IRS in the most advantageous manner. While there are no guarantees in dealing with the IRS, Todd Unger will guarantee that he will fight tirelessly to obtain the best tax settlement or IRS resolution. Unlike your communication with accountants and enrolled agents, your communication with an income tax attorney and his staff is confidential and privileged. The attorney-client privilege is essential if you have criminal tax exposure from unfiled tax returns, substantial understatements of income, foreign bank accounts, or have failed to remit payroll taxes. The attorney-client privilege provides a safe environment for you to disclose any information that may be relevant to your case without compromising your privacy. The tax law is incredibly complex and constantly changing. An experienced tax professional can help you understand the complexities of the tax law. 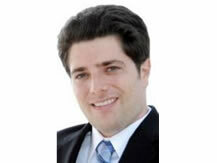 In addition to a law degree, Todd Unger has an advanced tax law degree (LL.M in Taxation). Todd Unger possesses the education, training, and experience to help you navigate through the complexities of the Tax Code and the IRS’s procedural maze. This knowledge is essential for settling a tax controversy with the IRS. Todd S. Unger, Esq. will provide you with the professional guidance and experience necessary to successfully settle or resolve your tax dispute with the IRS. The Law Offices of Todd S. Unger, Esq. LLC, is a law firm exclusively devoted to resolving civil and criminal tax disputes. Dealing with the IRS can be complicated, confusing, stressful, intimidating, and time consuming. Todd Unger is a tax attorney who will simplify the process, minimize the stress, level the playing field, and take the pressure and time of dealing with the IRS off of your shoulders. Dealing with the IRS can be complicated, confusing, stressful, intimidating, and time consuming — but with a dedicated New Jersey tax attorney on your side, the process can be less daunting. The Law Offices of Todd S. Unger, Esq. LLC, is a boutique law firm exclusively devoted to resolving tax matters. Bring your situation to our office, and Todd S. Unger, Esq. will provide the professional guidance and experience necessary to successfully settle or resolve your tax dispute with the IRS. As the tax lawyer New Jersey clients trust to resolve civil and criminal tax disputes, he has experience working with a wide range of complicated tax cases. Whether you need assistance dealing with a tax lien, responding to an IRS notice, defending a tax preparer investigation, negotiating a tax settlement, filing for innocent spouse relief, handling an IRS appeal, challenging the IRS in Tax Court, reporting foreign bank accounts, or resolving back taxes owed, Todd Unger is a NJ tax attorney who will simplify the process, minimize the stress, level the playing field, and take the pressure and time of dealing with the IRS off your shoulders. Enlist his help to make the stress of tax problems more manageable and to know how to respond in a way that lightens your burden instead of making it worse. The IRS help Todd Unger provides can make all the difference in helping you achieve successful results. Are you facing some kind of tax issue? 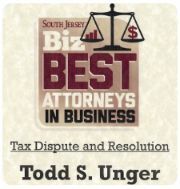 Could you use help from the strong negotiating skills and in-depth knowledge of tax law that a NJ tax attorney like Todd Unger offers? From trying to find tax relief to struggling with back taxes, dealing with the IRS isn’t something you want to do alone. Contact us today to learn more about our tax law services.